Loaded with high level features, the MF-1 matches the demanding needs of an elite and intricate player like Friedman. Learn some great warmup exercises from Marty Friedman. Marty Friedman details a few of the string-bending and vibrato techniques he uses and their best musical applications. 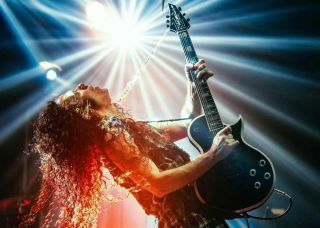 Marty Friedman demonstrates some cool ways you can achieve the effect of fast arpeggio-based sounds while avoiding the predictability of standard sweep-picking licks. “The type of thing I do is not simple music, but it should be simple to enjoy.” Marty Friedman breaks down his ferocious new live album. Take a lick, melodic shape or note sequence that you often use and move it to a different area of the fretboard. Friedman calls the mini acoustic "one bad m.f." In this lesson, Marty Friedman helps you build your speed and musical individuality. Join us as we sit down the thrash metal legend to talk about his upcoming new album, 'ONE BAD M.F. Live! !,' stories from the road, and much more. Marty Friedman Shares New Live Track, "Kaeritakunatta Yo"
Marty Friedman Shares New Live Track, "Dragon Mistress"
Learn how to take a basic melodic idea and morph it into something more nuanced and complex. Marty Friedman Shares New Live Track, "Mutation Medley"
The performance hails from the guitarist's forthcoming 'One Bad M.F. Live!!' effort. Get an exclusive sneak peek at the legendary guitarist's new live album.